help hold it in place. A terrain feature where an avalanche occurs. Composed of a Starting Zone, Track, and Runout Zone. An electronic device worn on the body to aide in quickly finding buried avalanche victims. Also called an avalanche beacon, it has the ability to send and receive a 457khz radio signal. The surface over which a fracture and subsequent avalanche release occurs. Can be either the ground or a snow surface. When the fracture of a lower snow layer causes an upper layer to fall. Also called a whumpf, this is an obvious sign of instability. A terrain feature that is rounded inward like the inside of a bowl, i.e. goes from more steep to less steep. A mass of snow deposited by the wind, often overhanging, and usually near a sharp terrain break such as a ridge. Cornices can break off unexpectedly and should be approached with caution. Wind blowing across a slope, depositing drifts on the sides of gullies or other terrain features. The top fracture surface of a slab avalanche. Usually smooth, clean cut, and angled 90 degrees to the bed surface. 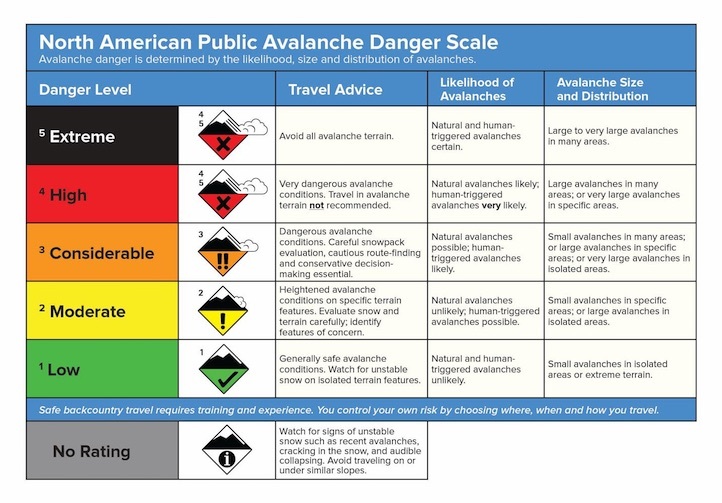 In the U.S., a five-category estimation of the avalanche danger: Low, Moderate, Considerable, High and Extreme. Avalanches that break deeply into old weak layers of snow that formed some time ago. Large-grained, faceted, cup-shaped crystals near the ground. Depth hoar forms because of large temperature gradients within the snowpack. An avalanche that occurs in snow below freezing temperatures. Angular snow with poor bonding created from large temperature gradients within the snowpack. The physical separation of the slab from the bed surface and surrounding snow during the initiation of a slab avalanche. When the entire snowpack slowly moves as a unit on the ground, similar to a glacier. A slab avalanche of hard, dense snow. When a snowmobiler ascends a slope to the highest point they can reach. Also known as hill climbing. When all layers of the snowpack are at the same temperature, usually the freezing pointt. Often refers to a snowpack that is wet throughout its depth. The addition of weight on top of a snowpack, usually from precipitation, wind drifting, or a person. An avalanche that releases from a point and spreads downhill collecting more snow - different from a slab avalanche. Also called a point-release or sluff. Snow grains that have partially melted and then frozen again. Weak layers that continue to produce avalanches for several days or weeks after a storm. A metal rod used to probe through avalanche debris for buried victims. The spreading of a fracture or crack within the snowpack. When the trigger point is outside of the boundary of the releasing slab. Supercooled water droplets that freeze to objects in exposed terrain, forming icy deposits on the windward side. Rime can also form on snowflakes as they fall through the sky, giving them a fuzzy appearence. The portion of an avalanche path where the debris typically comes to rest. Wind eroded snow, which often looks rough like frozen waves. Usually found on windward slopes. A stability test where a skier or rider rapidly crosses an avalanche starting zone to see if an avalanche initiates. Slope cuts can be dangerous and should only be performed by experienced people on small avalanche paths or test slopes. Backcountry skiers and some snowboarders ascend slopes using climbing skins attached to the bottom of their skis. A relatively cohesive snowpack layer. A mass of snow sliding, tumbling, or flowing down an inclined surface. Same as avalanche. The physical change of snow grains within the snowpack due to differences in temperature and pressure. A pit dug vertically into the snowpack where snow layering is observed and stability tests may be performed. Also called a snow profile. A slab avalanche of soft or low density snow. The chance that an avalanche will not occur, relative to a given trigger (usually the weight of a human). The portion of an avalanche path where an avalanche releases. When a slab avalanche slides a short distance and breaks down into deeper weak layers forming a stair-step pattern on the bed surface. A snow layer melted by radiation from the sun and subsequently refrozen. Featherly crystals that form on the snow surface during clear and calm conditions - essentially frozen dew. Forms a persistent weak layer once buried. When one avalanche triggers another avalanche some distance away. The change in temperature over snowpack depth. Terrain in which the consequences of an avalanche are especially hazardous, such as a gully, an abrupt transition, an avalanche path that terminates in trees, a crevasse field or a cliff. The portion of an avalanche path between the starting zone and the runout zone. A disturbance that initiates fracture within the weak layer causing an avalanche. In 90 percent of avalanche accidents, the victim or someone in the victims party triggers the avalanche. The area where a trigger initiates an avalanche. When a snowstorm deposits denser snow over less dense snow, creating a slab/weak layer combination. A poor bond between two adjacent layers of snow. A snowpack layer with less strength than adjacent layers. Often the layer in the snowpack where an avalanche fractures. The added weight of wind drifted snow. A cohesive layer of snow formed when wind deposits snow onto leeward terrain. Wind slabs are often smooth and rounded and sometimes sound hollow. The upwind side of an obstacle such as a ridge. Usually snow is eroded from windward slopes making them relatively safer.